M-PowerHouse of Greater Pittsburgh program Cradle 2 Careers conducted an animal youth assembly at Lincoln Elementary School in Pittsburgh, Pennsylvania to discuss the animal sciences and get more youth in underserved communities and schools interested in the animal sciences. Speakers included presentation from the Animal Rescue League Wildlife Rescue, Mr. Mel Hubbard El who is a board member of M-PowerHouseand Chief of Staff for State Representative Ed Gainey, Pittsburgh Police D.A.R.E. Officer Mike Gay, Pittsburgh Animal Hospital representive Leonard Miller and Terry Smith, President and CEO of M-PowerHouse. Awards of execllence and a gift certiciates were given to two Lincoln Elementary School youth for excelling in science and reading. M-PowerHouse. M-Powering Young Minds. One Mind At A Time. Animal Science Speaker Series with names Pittsburgh Police Officer Michael Gay #5 Station. Mel Hubbard El, M-PowerHouse Board Member and Chief of Staff Representing State Representative Ed Gainey and Leonard Miller representative of Pittsburgh Animal Hospital. Keynote speaker for M-PowerHouse program titled "Cradle 2 Careers" Mr. Chris Moore spoke with the 3rd graders at Woolslair Elementary School. He showed a short documentary he made about the Garfield Gators and spoke about the filming process. He encouraged the students to read and become knowledgeable about topics they are interested in and spoke about the importance of reading and writing to be able to defend their opinions and ideas. The students made connections to the films they made using iMovie and a green screen, as well as research they have done on the topic of “Should animals be treated equal to humans.” He listened to their positions on that topic and asked questions that tested their knowledge of it; showing the students how important it is to know your research. 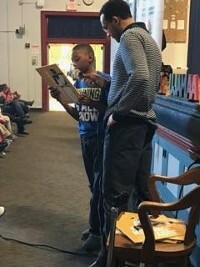 "Cradle 2 Careers" program partnered with the Pittsburgh Pirates Black History Month Long Live Their Legacy initiative. 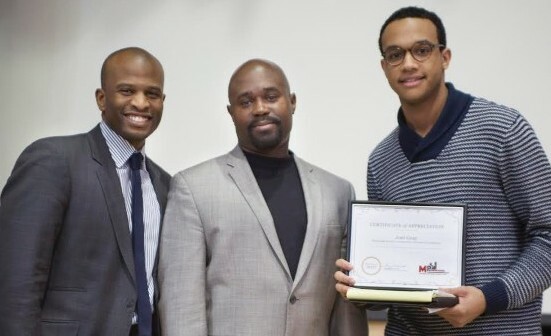 Picture below are Joel Gray Community Outreach Coordinator for the Pittsburgh Pirates, Terry Smith, President of M-PowerHouse and Keynote Speaker Joshua Pollard, CEO of Omicelo spoke to youth at Woolslair Elementary School and Miller African Centered Academy through the M-PowerHouse "Cradle 2 Careers" speaker series. Mr. Harold Hayes formerly of KDKA was M-PowerHouse of Greater Pittsburgh keynote speaker at Woolslair Elementary School. Mr. Hayes talked about the importance of an education and technology and film and social issues and obstacles that are often opportunitites if you keep your eyes on the prize and that is an education. M-PowerHouse. M-Powering Young Minds. One Mind At A Time. 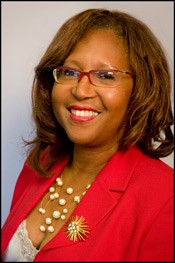 Minnie Forte-Brown is a Durham native, attended Durham Public Schools and graduated from Hillside High School. She holds a bachelor’s degree in speech and English from Saint Augustine’s College and a master’s of education degree in speech pathology and audiology from North Carolina Central University. She also has participated in doctoral studies at Howard University in Theory and Rhetoric in the School of Communication. Currently, Minnie serves as coordinator of speech communication and a master teacher in the Department of English and Mass Communication at NCCU. She has received numerous awards for teaching excellence and community service and is a frequent presenter locally and statewide. She is a member of Delta Sigma Theta Sorority, Inc., and White Rock Baptist Church. She has one daughter and two grandsons, all a part of the DPS family. She is married to Roger A. Brown. Investigator Gill is an investigator with the Durham Police Department. Investigator Gill is acutely aware of violence, homicide and how it impacts a community. Investigator Gill gives his words of wisdom and warning to youth about making the wrong decisions through peer pressure. Jacqueline Lopez of the Durham Police Department Crime Prevention and Victim Services Unit will speak to the youth and parents about how not to become a victim and the mission of the Crime Prevention and Victim Services Unit. Mr. Smith is dedicated to enhancing the quality of life by educating, motivating and promoting youth and community engagement through literacy and thwarting illiteracy, recidivism and reducing the cradle to prison pipeline® epidemic by enhancing healthy life style choices. Mr. Smith assembled and continues to muster friends, mentors and professionals from various disciplines to address bullying, harassment, violence and the socio-economic impact poverty has on children and their community.